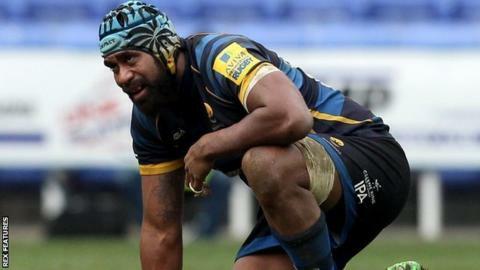 Worcester Warriors lock Tevita Cavubati has been banned for nine weeks for biting Jebb Sinclair in Sunday's Premiership loss at London Irish. Cavubati, 28, was also ordered to pay £500 costs following a Rugby Football Union disciplinary hearing on Tuesday. "I would like to apologise to my team-mates, the coaches and supporters," said the Fiji international. "I was struggling to breathe and reacted in a way I would never normally do. I sincerely apologise to Jebb." He added: "It was uncharacteristic and this is not the type of player I am." Cavubati has made 12 appearances in all competitions since joining Warriors in September. Warriors currently sit 10th in the Premiership table, one point above Irish and bottom-of-the-table Newcastle Falcons. Worcester Warriors scrum-half Luke Baldwin, signed from Bristol last summer, has signed a new undisclosed-length contract at Sixways. Baldwin, 25, has started Worcester's last four matches, having taken his chance following injuries to Jonny Arr and Charlie Mulchrone. "As a young English nine Luke Baldwin has got potential," director of rugby Dean Ryan told BBC Hereford & Worcester. "At the moment he's got a great chance to show himself in the Premiership and he's maximising his opportunity."